The ocean absorbs a quarter of the annual carbon dioxide (CO2) humans release into the atmosphere through wave action (NOAA). Chemically, this forms carbonic acid, which ultimately dissociates into hydrogen (H+) and carbonate ions (CO3-2). Since the industrial revolution, the concentration of hydrogen ions in the ocean has increased 29%, lowering the pH of the ocean by a staggering 0.11 units (WHOI). This phenomena is called Ocean Acidification. Ocean Acidification is a global problem that poses great threat to the future of the ocean; scientists estimate that without dramatic and collective change in human behavior and consumption, the ocean could drop another 0.3-0.4 pH units before the end of the century. To inspire such change, or collective action, communities must introspect and foster the education of their citizens — particularly youth. Empowering communities with environmental education opportunities such as the NOAA Bay Watershed Education and Training program and citizen science can result in powerful learning outcomes that promote conservation and stewardship, informed advocacy, and science literacy. These learning outcomes formed the purpose of the Port Townsend Marine Science Center's Ocean Acidification Study through Systems and Inquiry Science (OASSIS) Project, which implemented a twelve-class, hands-on Ocean Acidification curriculum within a Chimacum High School AP Environmental Science classroom. We adapted the curriculum for this project from the Baliga Lab at Institute of Systems Biology Ocean Acidification module (Systems Education Experiences). Unit lessons encompassed ecological networks, Ocean Acidification chemistry and sources of CO2, the scientific method and experimental design, and citizen science. 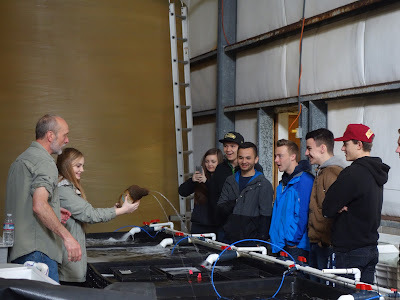 Students visited the Taylor Shellfish Quilcene Hatchery (Figure 1), and observed how shellfish farmers are working to offset and mitigate the economic consequences of Ocean Acidification on the industry. Ocean Acidification hinders larval shellfishes’ ability to form a protective shell and can corrode the shells of adults. Later, we visited the North West Fisheries Science Center's Mukilteo Research Station, a hub for international Ocean Acidification research. There, students learned about careers in science, technology, engineering, and math (STEM) careers from NOAA researchers and educators. Finally, the students visited the Port Townsend Marine Science Center, where they studied plankton collected from each field site and local marine fauna. clams from the hole by species. measuring local water quality parameters. At each of the three field sites, students towed plankton, measured water quality parameters (Figure 2A), and performed a clam population survey (Figure 2B). We adapted the protocol from Washington Department of Fish and Wildlife management surveys, which are used to determine seasonal take limits. Every 20 m along a 100 m transect parallel to the water, students dug three 1 ft3 holes. The holes were increasing distances from the water line. Students combed through each hole’s contents, noting substrate and identifying each clam (and whether or not it met the legal harvest size of 1.25”). ocean acidifcation and other disciplines. At the end of the OASSIS unit, students further investigated a component of Ocean Acidification of interest to them through research experiments. Project topics ranged from testing the combustive effects of various carbon sources (coal, wood, paper) on the pH of water (Figure 3) to comparing the dissolution of shells at varied pH levels. Students used Vernier LabQuest2s, which allowed them to collect data in real-time. The OASSIS unit culminated with a summit, at which students presented a scientific-style poster on either their research project or another significant unit component (Figure 4). Preparation for the summit fostered critical-thinking and a formal reflection of experiences; presenting the posters enabled students to communicate and share their knowledge of Ocean Acidification with their peers and broader community. One of the greatest personal challenges of being an informal environmental educator is that I frequently have only one interface with my students. Thus, there exists a fine balance between time spent developing interpersonal bonds and teaching content; learning is not achieved if these practices are left mutually exclusive. As the lead Marine Science Center AmeriCorps member on the OASSIS project, I had the unique opportunity to interact with students 12 times over a period of three months. Through this experience, I truly came to understand these students as individuals and better meet their needs as an educator and mentor. The most meaningful part of this experience, though, was not personal. Rather, it was hearing students’ personal accounts of knowledge gained and inspiration piqued. Some students did not know how the impacts of Ocean Acidification encompass their everyday lives, and others now have deep interest in pursuing environmental science as a major in college. Seven years ago, I had my first field-based marine science experience, Ocean For Life (OFL) which was also sponsored by NOAA. Upon competing OFL, I distinctly remember feeling intellectually and emotionally enriched. I sincerely wish these students too are able to capture and culture this same eternal wonder for our ocean. What a fantastic curriculum and outstanding experience for these students and our community! Thank you, Zofia, for your leadership in this important project for PTMSC.